I am loving the fabulous quality GLIMMER PAPER that is now available in 3 colours from Stampin' Up!®. Red, Silver and the new Champagne. They are all suitable for Christmas card highlights, scrap page embellishments or creating those special little tags. Today I've combined mine with a rosette made using the new BIGZ XL DIE - DESIGNER ROSETTE. You MUST use the EXTENDED PREMIUM CREASE PAD on top of the die , and to make a rosette this size you will need 2 pieces joined together after they have been cut. Another feature that is really great is the 2 different edges on the die. You can see the scalloped edge in the photo, and on the inside edge there is a nice pointed edge, a bit like a picket fence. Both of these create interesting edges and it is your choice which one you use. The centre silver motif is created using the new PAPER DOILY SIZZLITS L die. Another absolutely gorgeous die now available from Stampin' Up! in Australia, and one you will certainly want for scrap book highlights. It can be a bit fussy pushing out all the small shapes, but once you experiment a little you'll find the right combinations to use for your BIG SHOT and you'll create tons of these in no time flat. 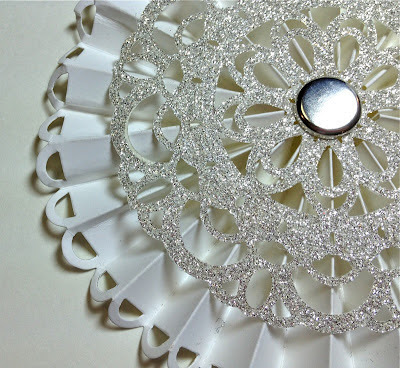 I have purposely left some of the shapes intact in the detail sample below and when you try this you can create a myriad of different Doilies, all from the one die. 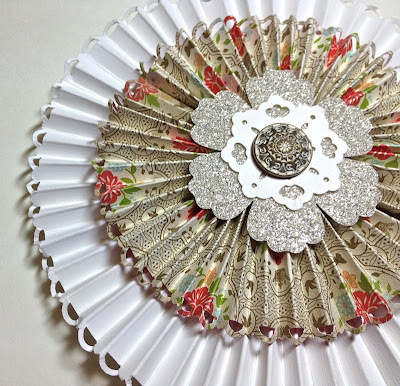 The doily can be used as a mask for creative sponging, as a topper for a pretty box, or an embellishment on both sides of your rosettes so you can hang them on a string and both sides will look great, etc. Made from Vellum - 4 pieces attached together with sticky strip. 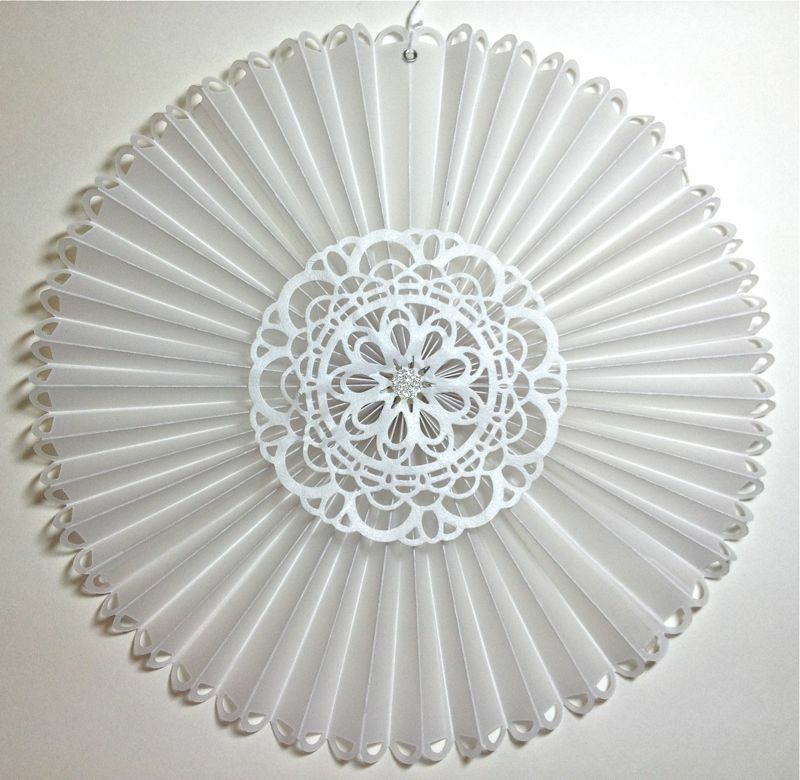 Paper doily adhered to centre on both sides. 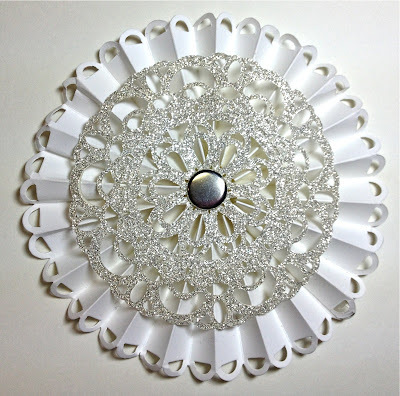 Create an elegant look: more than one rosette is piled on another. The last sample is actually hand punched with the SCALLOP TRIM BORDER PUNCH before being scored every 1/4 inch using the SIMPLY SCORED SCORING TOOL. 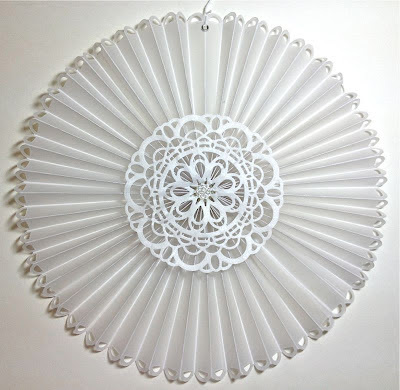 This is another wonderful alternative and you can make the scores as wide or narrow as you choose. My stamping studio is starting to fill up with these decorations hanging around from doorways, the ceiling and attached to cupboards. I guess by the time Christmas comes I won't have too much decorating left to do! You are also welcome to attend my NEW CATALOGUE LAUNCH on Sunday September 9th for a fun afternoon of crafting with new products.